Just 27 miles off the coast of Naples, the famous, craggy island of Capri rises from the clear jade waters of the Tyrrhenian Sea. A longtime hideaway for stars and celebrities, the island is home to fabulous restaurants, shops, and sites of natural beauty—including the spectacular, illuminated sea cave known as the Blue Grotto. Your full-day tour (great for shoppers, foodies, and those with limited time to explore) lets you take in all of these—while accompanied by a seasoned, English-speaking guide whose knowledge enriches every aspect of your trip. After meeting your greeter in Rome Termini train station at 7:15 a.m., you’ll take a high-speed train to Naples. 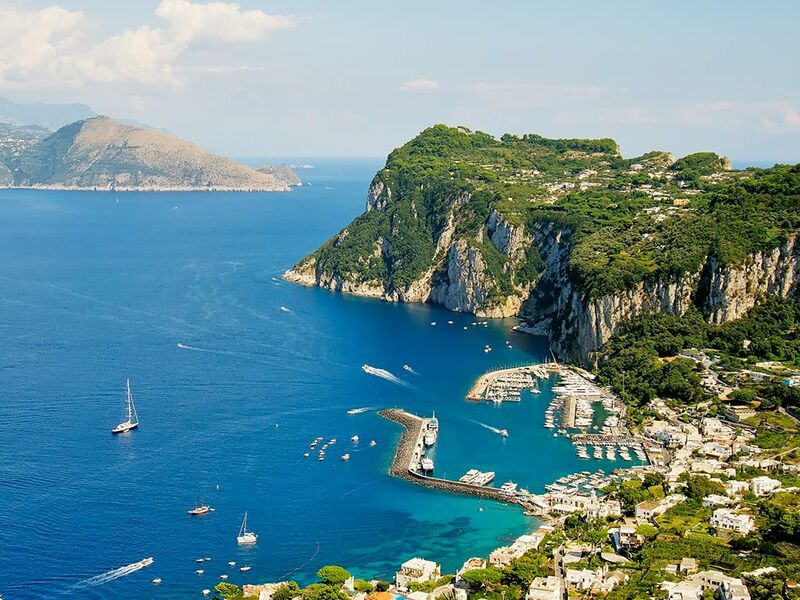 Once you've arrived, you'll board the ferry that will deliver you among the anchored luxury yachts of Capri’s Marina Grande. The shops and restaurants of Capri town sit high on the cliffs above the harbor. You’ll take a quick funicular ride with your guide to get there—while marveling at the stunning views. Once you’ve arrived, you’ll enjoy a welcome glass of limoncello, then wander among the town’s many chic cafes and shops (including Carthusia I Profumi di Capri, a perfumery whose tradition of creating beautiful scents is said to date to the 14th century). If you wish, you can choose to spend part of your time on Capri taking a boat ride to see the island’s most unique natural formation: the Blue Grotto—a sea cave where sunlight filtering through the water turns it neon blue. Your group will then meet up in the late afternoon to start the trip back to Rome. Please be sure to arrive at the tour 15 minute before starting time. Guests arriving after departure cannot be accommodated, and missed tours or tickets will not be refunded. Please note that the boat journey to Capri will occasionally be affected by adverse weather and sea conditions. If you are predisposed to motion sickness, please take necessary precautions before your journey. Please note that excursions to the Blue Grotto must be purchased on site, and the only method of payment accepted is cash. Access to the Blue Grotto is always subject to weather conditions. A hat, sunscreen, and bottled water. Many parts of the tour are not shaded.